CHARLOTTE, N.C. (AP) — JJ Redick’s last triple-double came in high school. Perhaps there was some leftover magic in Redick’s locker. 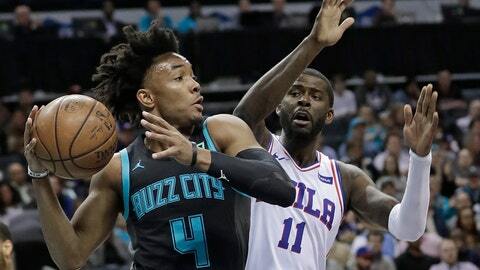 The Hornets didn’t make it easy on the 76ers. Harris made 1 of 2 free throws with 8.2 seconds left, giving the Hornets one last chance to tie or win the game before Lamb’s shot with 2 seconds left rimmed out. Harris then added two free throws for the final margin. The Hornets were able to stay close, trailing 62-59 at the break despite Walker only playing six minutes after picking up three fouls in the first quarter. Charlotte’s bench was a big reason why, outscoring the 76ers 31-4 before intermission. 76ers: Mike Scott fouled out with 5 minutes left after playing just 15 minutes and failing to score. … Ennis had 14 points off the bench on 6-of-9 shooting. Hornets: Michael Kidd-Gilchrist left the game late in the third quarter with a head injury after a collision with Amir Johnson in the backcourt as Kidd-Gilchrist was attempting to bring the ball up the court. Kidd-Gilchrist did not return. … Cody Zeller also sat out with soreness in his left knee. Amir Johnson got the start at center with Joel Embiid sitting out to rest in advance of Wednesday night’s game against the Celtics. Part of that the result of Brown playing his starters extensively with Simmons and Harris both playing 38 minutes, while Butler and Redick played 37 minutes. Brown said he didn’t want to do that, especially on the first night of a back-to-back but felt he needed to. Borrego’s trust in second-year player Dwayne Bacon is increasing. Bacon was on the floor again in the game’s final minutes and was aggressive in the taking the ball to the rim.